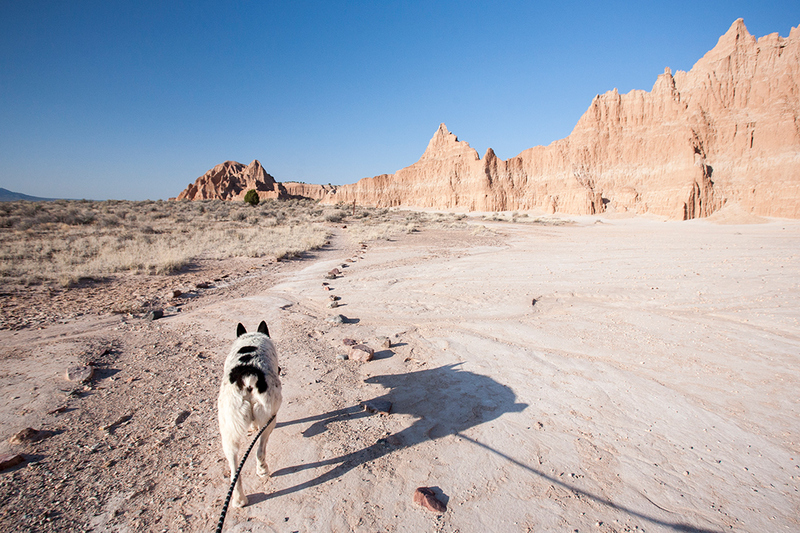 Eastern Nevada was a new area for us, so we were excited to check out the dog-friendly Cathedral Gorge State Park (PDF map). However, visiting in June meant warm temps, and with sunrise being 5:15am, we knew we had to get an early start if we wanted to explore the park with dogs. It was forecast to be 75 °F and sunny by 10am, so we set our alarm for 5am. We were staying in the nearby town of Pioche (more on that later), so our drive to Cathedral Gorge was only about 15 minutes. We arrived, paid the Iron Ranger $5, and were out of the car by 6am. The dogs were amped to get started! Our plan was to hike the Juniper Draw Loop first. That way, we would be doing the longest walk during the coolest part of the morning. We parked at the day use picnic area. Aside from the campground we saw in the distance, we were the only folks around. 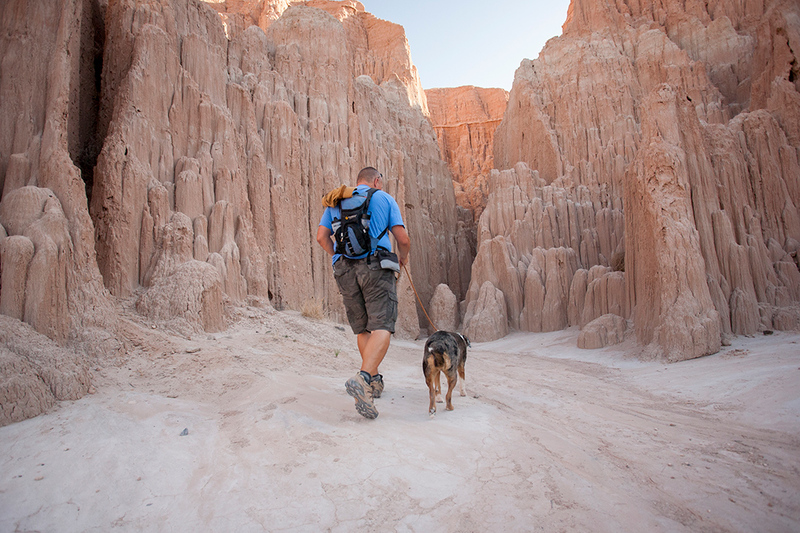 That's our favorite way of hiking! 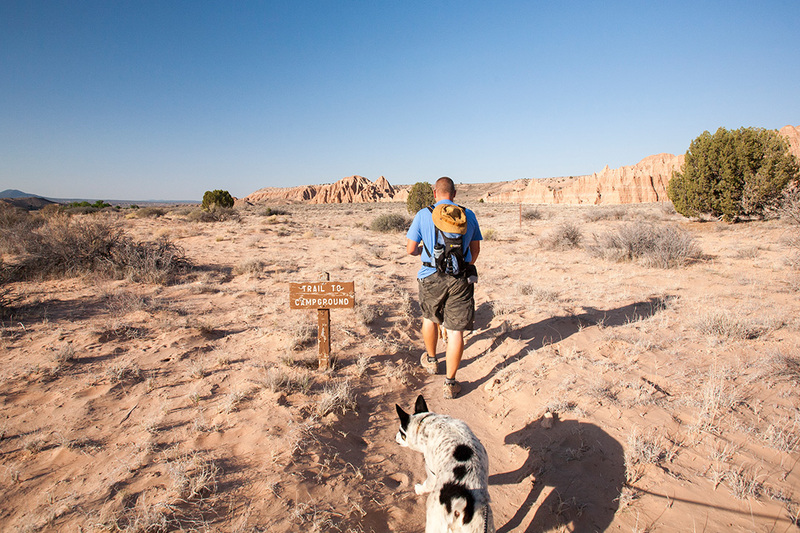 The Juniper Draw Loop Trail meanders around the valley and is very flat, and easy to walk, except for a few sandy areas here and there. We saw some narrow tire tracks, so people must bike it too. We found one unmarked "cave" early on, which Lily proudly explored. What's better than an Elf on a Shelf? A Lily on a Ledge! At about 1.5 miles in, you have the option to continue on the loop or branch out to Miller Point. We opted to stay on the loop, because we were planning on visiting Miller Point on our way out of the park, via car. 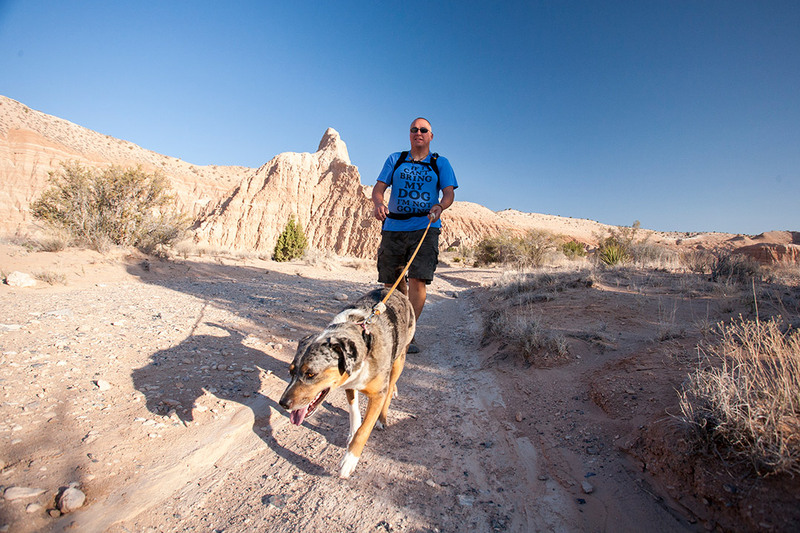 Having just come from Southern Utah, we told ourselves not to expect too much of the Juniper Draw Loop Trail. Most of the "must-see" parts of this park are the caves, which can be easily reached from the main entrance road. 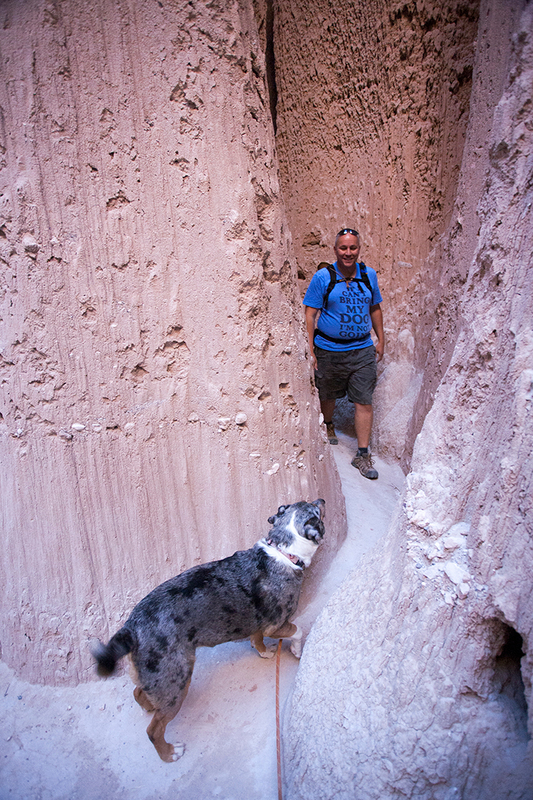 (The "caves" are really slot canyons formed in soft clay, not actual caves.) But our dogs needed to burn off some energy, so a several mile walk was perfect. The scenery is pretty, but a lot of the same, with not much shade. However, that's just the opinion of those with two legs. 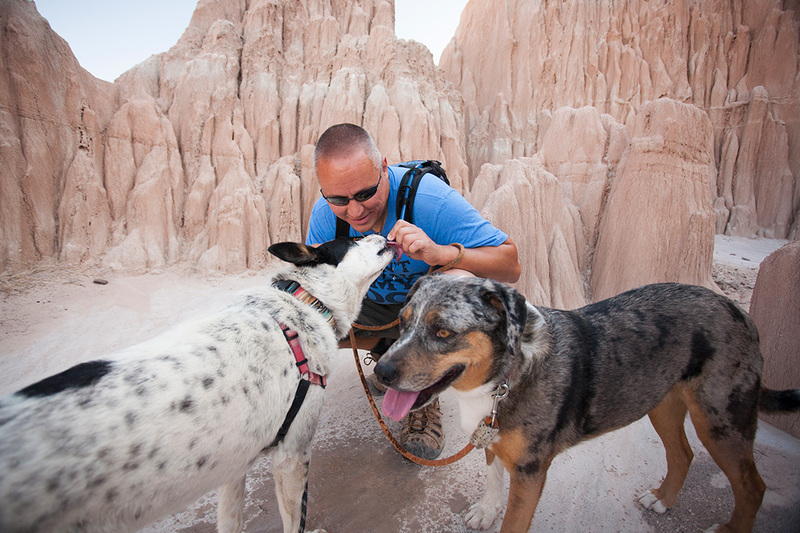 The four-legged members of our crew were enthralled! It was just after 6am so they saw tons of cottontail rabbits, jackrabbits and lizards! The dogs were on what we like to call a "bunny high", and would have been running the trail if we could have kept up. Instead, they settled for our fast power-walk pace. 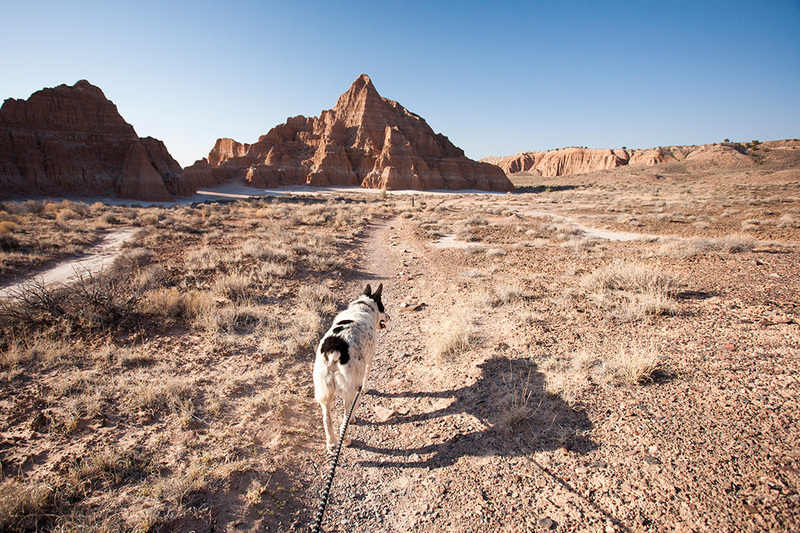 Note: This State Park requires all dogs be on leash. 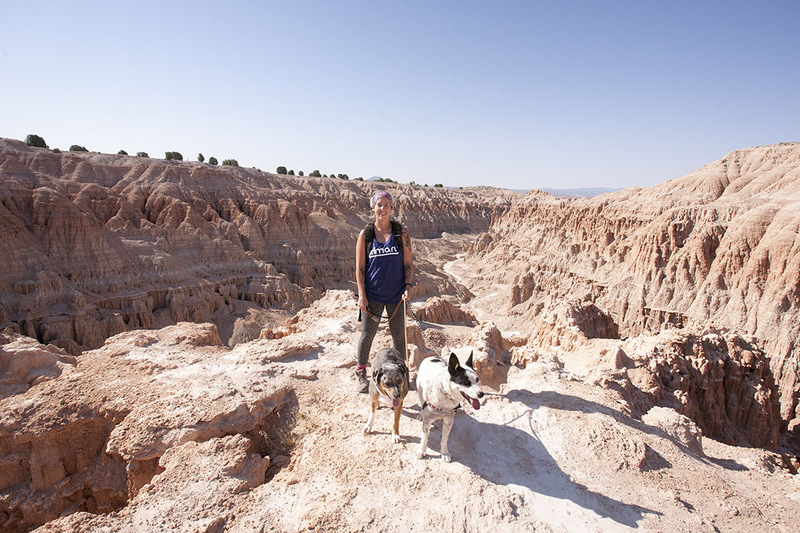 We took the trail towards the campground and walked around the far end of it to make our walk longer, and to check out the facilities in case we wanted to stay here with the RV in the future. 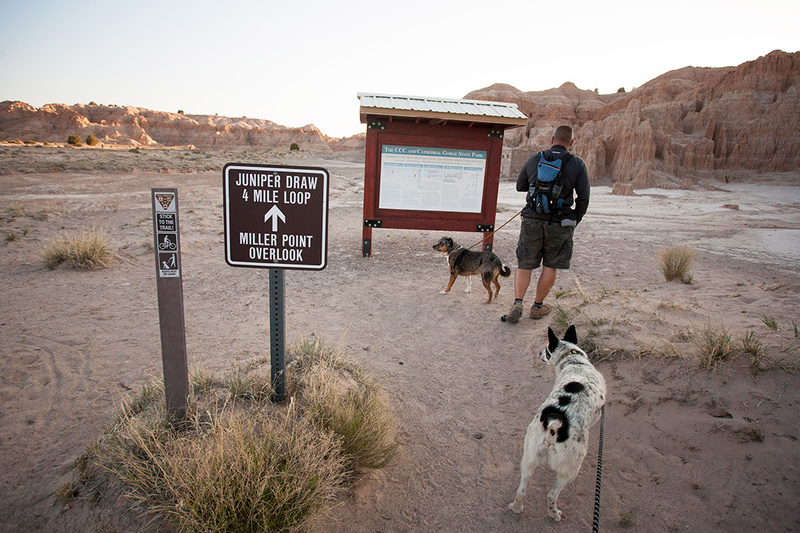 Once you pass through the campground, the Juniper Draw Loop connects you back to the Day Use parking area by connecting with the Nature Loop Trail. Since this was the end of our big "hike", we now had time to explore the caves. Mushy says he's king of the castle. Lily disagrees. All hail Queen Lily Goodgirl! Some of the caves have forks you can take which lead you to different chambers. They're really fun to explore and some go pretty far. The deeper you go, the darker they get, so it's tricky to get a good photo. 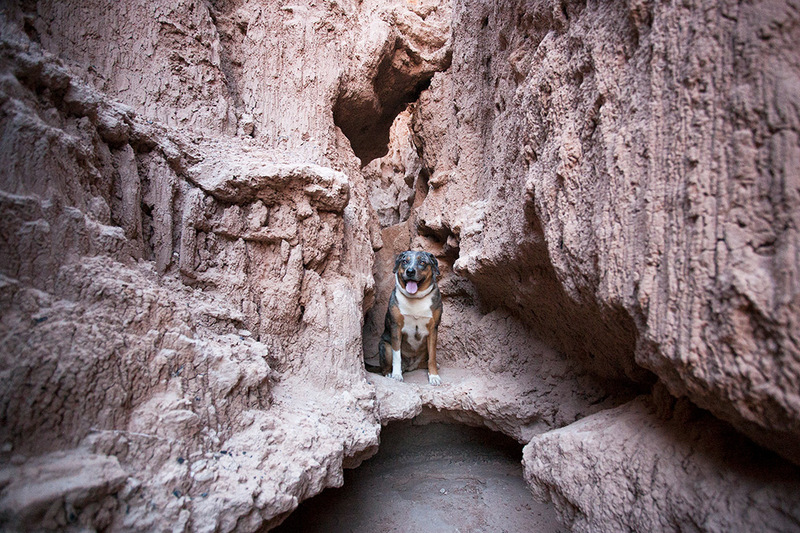 I had stayed back to hold the dogs while Tommi explored a long, narrow fork of a cave. Lily hates being separated from her Tommi and is always concerned he's "stuck in a well", like Timmy from Lassie. She was overjoyed when he finally came back. You can tell by the motion blur of her tail in this photo. There's a noticeable drop in temperature when you enter the caves, so it's a welcome cool area to explore on a warm day. 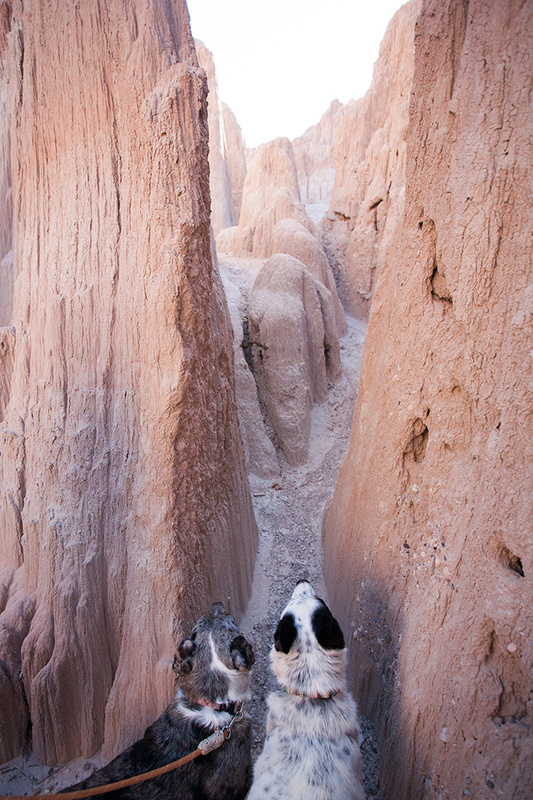 Our dogs were definitely disappointed when we finally told them we were heading back to the car. I think they would have gone in EVERY. SINGLE. CAVE. They were having such a great time and even found a dead lizard in one. Bonus! Anyone else with multiple dogs have this issue? Where they both try to enter or exit a tight space at the exact same time? When this happens at our RV door, we call it "rush hour". Apparently Mushy was never taught basic manners. Ladies first! After we loaded everyone back in the Jeep, we exited the park and drove north on Highway 93. There's a separate road, just a mile or two up on the left, that leads you to Miller Point and Eagle Point. 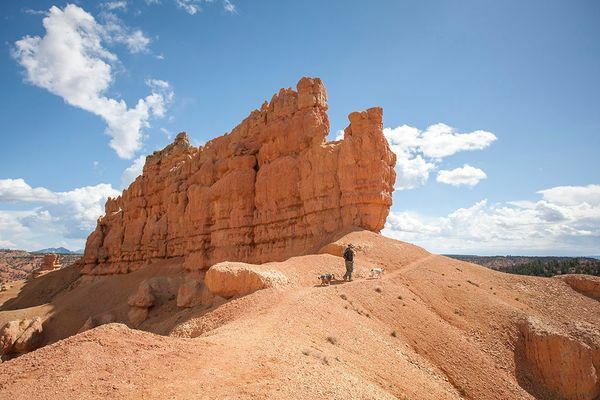 Miller point has quite dramatic hoodoo shapes. Eagle point will give you a birds-eye view of the entire park. Since it was getting pretty hot at this point (8:30am), we decided to just check out Miller Point. The stairs are right next to the parking lot, so this doesn't have to be a long stop if you don't want it to be. 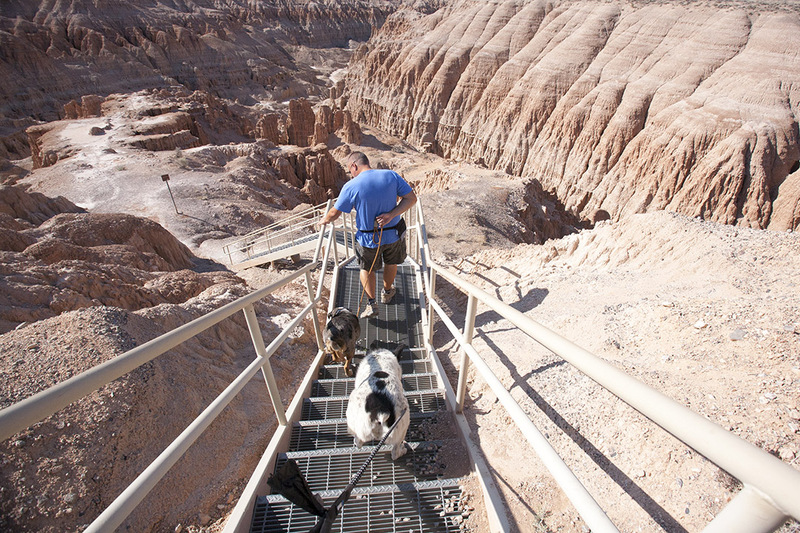 The dogs were definitely a bit skeptical about walking down the grated steps. We felt them with our hands and they weren't hot, and the grates were close together, so we decided it was safe. Once they took the first few steps, the got the hang of it! 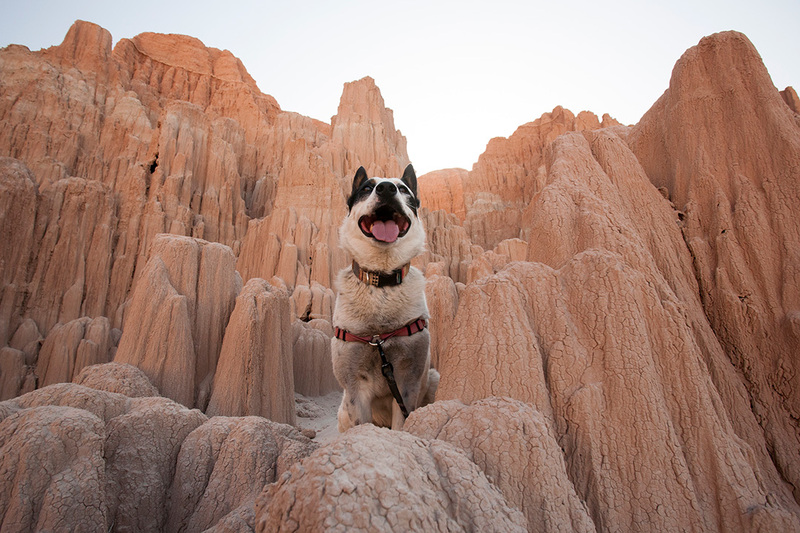 Adventuredog achievement unlocked! You definitely get a stunning view of the valley from here. I imagine it's even more breathtaking at sunset. At this point it was 9am. 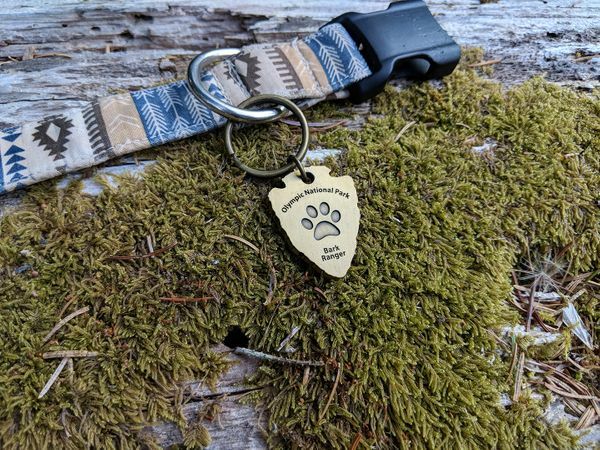 The visitor center had just opened and because Mushy collects patches for his adventuredog backpack (for every new park he visits), we had to go see what they had for sale. 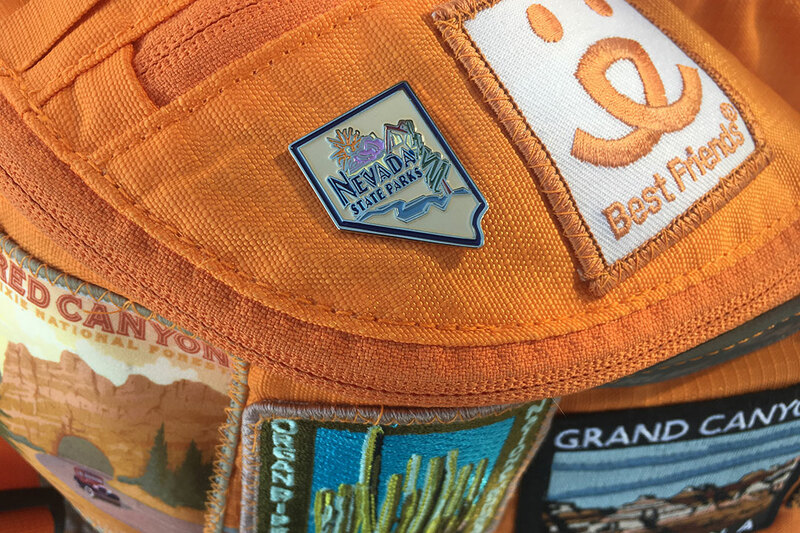 Unfortunately, they didn't have a Cathedral Gorge patch, but they did have a Nevada state parks pin, so we went with that! 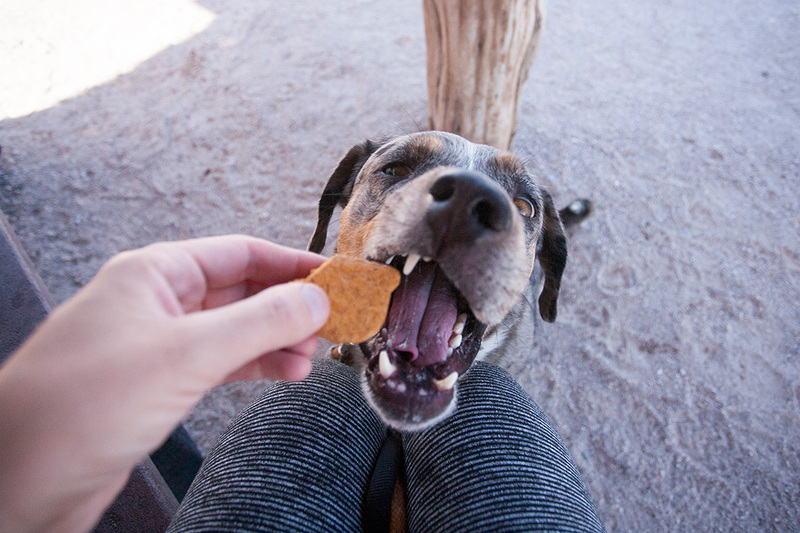 Nevada is Mushy's 5th state as an RV Adventuredog. Needless to say, he's loving every minute of it! 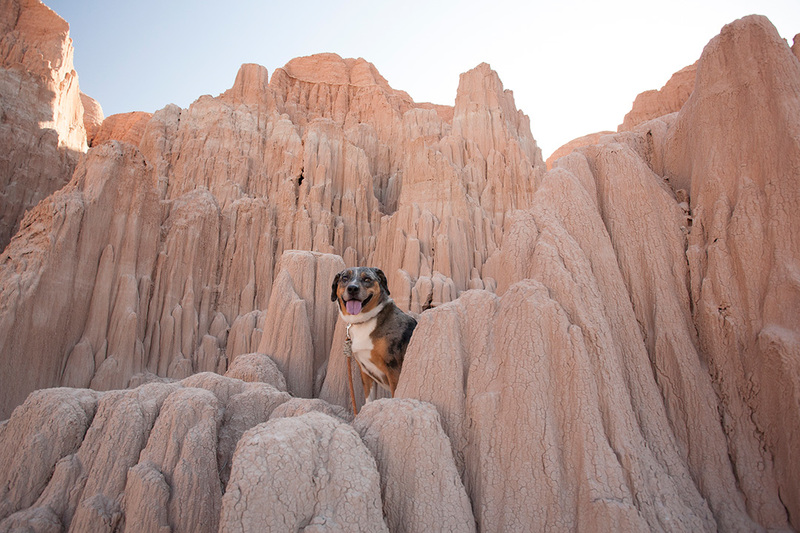 We highly recommend this dog-friendly park, as long as you go when the temps are cool. There are several places in this park to get drinking water, but on hike days we always fill up our Camelback so we don't have to worry about running out of water. Yes, we're those people that let their dogs drink out of their cups... and Camelbacks! Tommi Protip: If you want to walk the Juniper Draw Loop in the morning, I recommend you walk it counterclockwise (the opposite of what we did). That puts you in the shade on the later and warmer part of your walk. 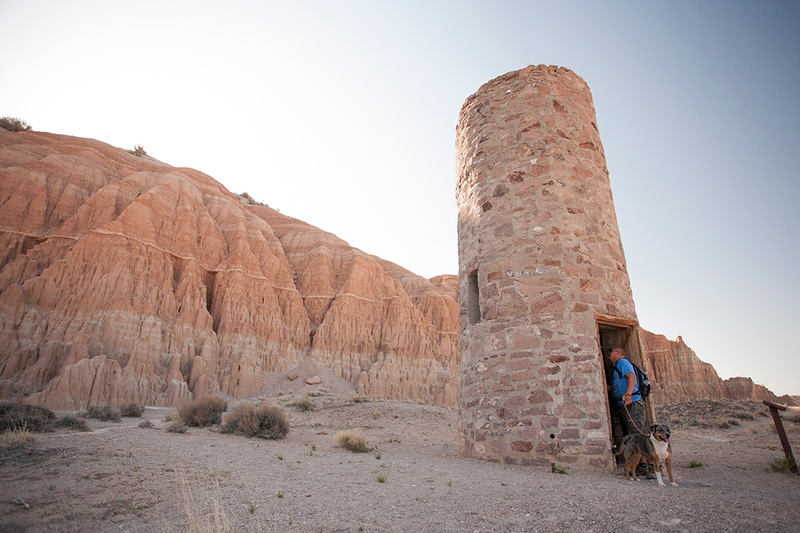 Checking out the old water tower near the day use area. Number of snacks eaten: Too many to count, yet never enough. Okay, okay, I told you I'd tell you about where we stayed in Pioche. Along with several commercial full-hookup parks, they have a city RV park with 10 sites! We love when cities do this! Each site has water and sewer hookups, along with a trash bin. No electric, but we don't mind that because we have solar. The city allows you to stay for free, for 7 days! They appreciate donations, so if you stay, please think about throwing them a few bucks. We enjoyed our stay here very much. At most, there were only two other rigs here with us, and we had deer visit the nearby lawn at dusk many nights. Pretty much all you need to know is on that sign! 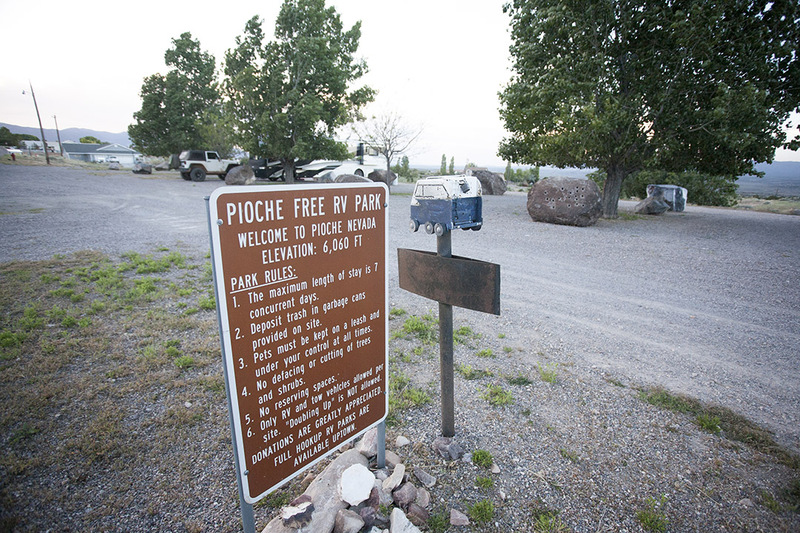 Pioche was known as one of the toughest and most lawless towns of the Old West. It's reported that 75 men died here, with their boots on, before anyone died of natural causes. If you visit, make sure to check out Boot Hill Cemetery and see if you can find the grave marker that says, "Died during dispute over a dog." I'd definitely take a bullet for Lily or Mushy, so I understand! 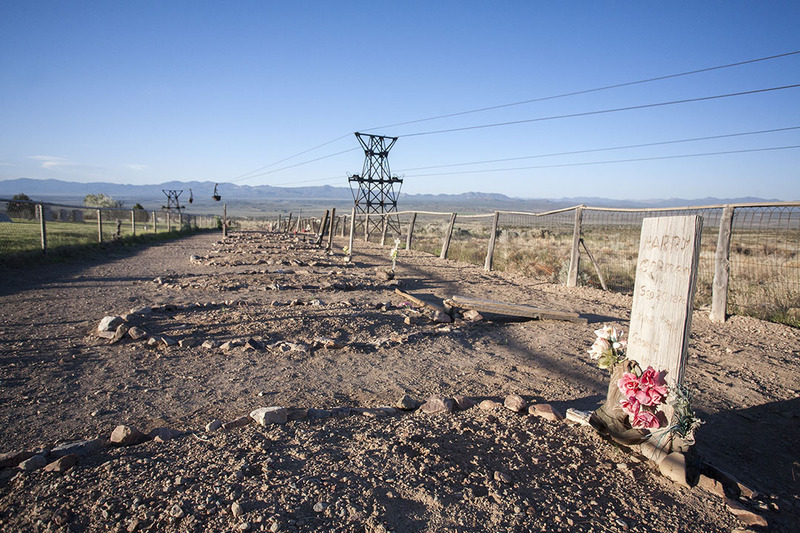 The old Pioche Aerial Tramway, complete with ore buckets, still hovers above Boot Hill Cemetery.